Cardiff Preview – can they do it again? Can they do it again? Win the FA Cup? Little has been mentioned about it in the media but Wigan Athletic are in the last 16. It is only the third time in their history that they have done that. This time last year Latics went to Huddersfield and beat them 4-1. With his team struggling Roberto Martinez had made seven changes to his starting lineup, indicating that a Cup run was secondary to Premier League survival. At that time he could not have guessed that Latics would win the FA Cup and shake the foundations of the football establishment. In Saturday’s match Ole Gunnar Solskjaer faces a similar choice to that previously faced by Martinez. Cardiff City currently lie in 19th place, but just two points behind safety and 17th place. For their fourth round match at Bolton Solskjaer made five changes from the team that started the previous league game. That included key players Steven Caulker, Fraiser Campbell and Gary Medel. Cardiff were to win at Bolton through a Campbell goal after home keeper Andy Lonerghan had spilled the ball. However, it should be noted that in the third round they had an excellent 2-1 win at Newcastle. Wigan Athletic’s lineup in the third round home tie against MK Dons included five players who had played in that famous FA Cup Final. Latics’ goals in the 3-3 draw came from three of those heroes – Roger Espinoza, Jordi Gomez and Callum McManaman. Of those players only Roger Espinoza and James McArthur have played in the three FA Cup ties Latics have played so far. However, there is no doubting that all the players who played in last year’s cup run would love to make Saturday’s lineup. Uwe Rosler has made it clear that he rates the FA Cup as an important competition, despite the pressures he faces in getting Latics into the Championship playoffs this season. Rosler deems squad rotation as a natural occurrence, a view foreign to those who criticize him for not having a settled lineup. He cites the example of Alex Ferguson of never having the same lineup in successive games. The German is much harder to read in his team selections than his predecessors. However, he has given both Callum McManaman and Roger Espinoza a break in the last two matches, so they are likely to make the starting lineup at Swansea. Both will have a lot to prove. Espinoza scored one of the goals of the season in the home game with MK Dons and will be keen to show what he can do to get a regular place in the starting lineup. He has now been with the club for 13 months, but has not been able to claim a regular first team place. He is a fan favourite for his commitment and he shows no mean level of skill, but he has yet to convince Rosler that he should be high in his priorities. McManaman is the most talented player remaining at the club. If it had not been for an injury in the Arsenal match just three days after the FA Cup Final he probably would not be at Wigan now. Being ‘’Man of the Match” in an FA Cup Final is something he will savour for the rest of his life. Life at Wigan has been a rollercoaster ride for him as I outlined in in my article of September. Cardiff are a Premier League side and they will be facing Championship opponents. The bookmakers make them favourites. However, as Cup-holders Latics will give it all they have got. Moreover Wigan have a core of players, who have not only Premier League experience, but have helped the club win the FA Cup. Those who remain from the Cup winning team will be keen to show that they can still do it. Moreover they will be backed up by players brought in by Owen Coyle who have ample Premier League experience. In terms of the lineup on Saturday it might well be that Wigan have more players with Premier League experience than Cardiff. But then again we will have to see the lineups the managers put out. The bad news for Latics is that Rosler’s new strike force – Nicky Maynard and Martyn Waghorn – are cup-tied and unable to play. Moreover central defenders Markus Holgersson, Ivan Ramis and Thomas Rogne are not yet fully fit, although they played in an under 21 game in midweek. In their absence Emmerson Boyce and Leon Barnett will once again play in the middle. Jean Beausejour has started in two consecutive matches within the space of three days, so will most likely be rested, with Stephen Crainey brought in. Rosler may need to rest either or both of Ben Watson and James McArthur who have played a lot of football recently. Cup winners Roger Espinoza and Jordi Gomez will be keen to step in. The front three will most likely be Callum McManaman, Marc-Antoine Fortune and Nick Powell, assuming the latter is now fit. 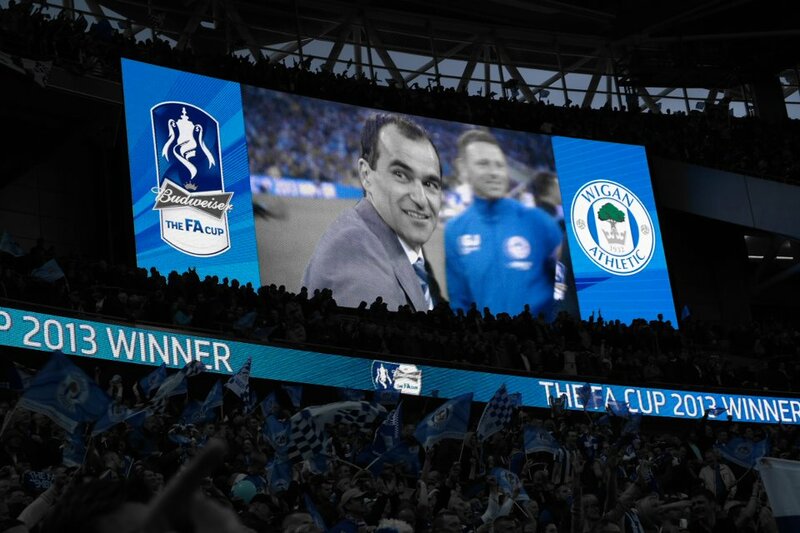 One thing is for sure – Latics will not relinquish their hold on the cup without a fight. Getting into the last eight is certainly a possibility. Who knows – maybe they can do it again?